Signs that are manufactured must be subsequently transported to the sites where their use is intended, and then fitted in the desired locations. This practice is known as sign installation. 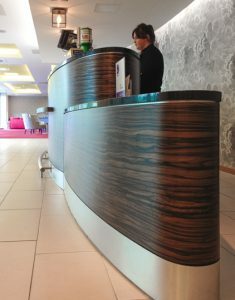 Sign installation is a skill comprising many techniques and regulated by both statute and by practical considerations. Signs are very often installed in locations that are conspicuous but that present difficulties in terms of access. Such locations may be exposed and at great height. Locations may require that personnel be certificated appropriately for example in airports. Locations can be in areas with heavy traffic or that are densely populated. Good sign installation practice is driven by strong project management and well managed surveys. Surveys in particular ensure that both the sign and the team responsible for its installation, encounters no surprises that are not known to the project plan. Installations often involve ground works. For example, a free standing sign sometimes known as a totem sign or a monolith sign, must be bolted or otherwise affixed to a footing means sufficient to support the sign and resist any forecast wind-loading. Electrical services must be supplied to the sign too and this will be the responsibility of the sign installation team. 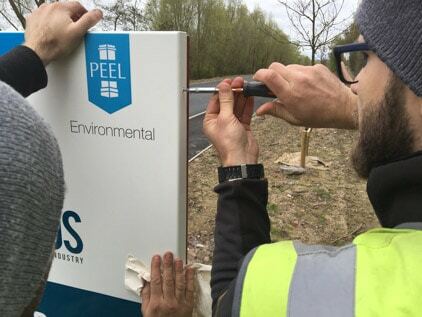 Sign installation may on some occasions involve the removal and disposal of existing works. Again this is a job that may face added complexities if the location is difficult. Access often has to be planned and agreed with local bodies before works can proceed. Such processes are undertaken by competent sign manufacturers. Sign installation is typically undertaken by crews who travel in vehicles equipped to support them. Such crews are trained engineers and electricians and are able to safely operate and provision powers supplies where needed. Sign installation is very rarely undertaken by the end-user due to access difficulties and the need for specialist skills, permits and tools. Once installed, signs are subject to the effects of the ageing of time-limited components and wear and tear imposed by weather. Sign maintenance is designed to mitigate these and other effects and so keep sign performing optimally. 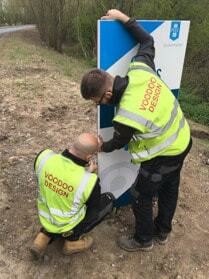 Sign maintenance can be managed on a needs-based per-incident intervention basis, or in a planned fashion which sees a crew attend the sign and then perform works required to replace aged components, clean standing structures and make good any damage. Sign maintenance will be required in situations where damage has been incurred, for example a breakage caused by high winds or by vandalism. Repair may be effected by replacing parts of the sign known to be damaged or by repair on site where possible. Signs can experience many modes of failure. More recent signs have reliable LED lighting and so outages caused by the failure of earlier means of illumination are greatly diminished. The accumulation of airborne dirt can impair a sign’s performance and so this represents one of the most common of all service interventions. Sign are manufactured from materials designed to endure exterior conditions. These materials include plastics, metals and woods. Such materials are often finished with weather resisting coatings including paints and so resist exterior conditions. If kept in good repair, a sign may last twenty-five years or much longer. Signs that are allowed to deteriorate without sign maintenance may require replacement or total refurbishment and a newly commissioned sign installation. When a sign is sold, its manufacturer may approach the subject of a maintenance programme with the customer commissioning the sign’s production. A sign maintenance programme may achieve more than simply keeping the sign in operation. It will ensure that the sign performs optimally and so favourably halos the brand of business it is working hard to promote. On that basis alone, sign maintenance is seen by many as good value.